(Bloomberg) -- Chilean president Sebastian Pinera picked up a photograph from his desk in Santiago’s La Moneda Palace. “Do you know who this is?” he asked reporters. There in the picture was Chinese President Xi Jinping, talking and gesturing as a grinning Pinera held a wine glass. But presidential chumminess hasn’t helped bring China’s Belt and Road infrastructure initiative to its last Latin American frontier. Despite Pinera’s endorsement, a public-private partnership to build the first high-speed rail line in the region is stalled in a regulatory web. 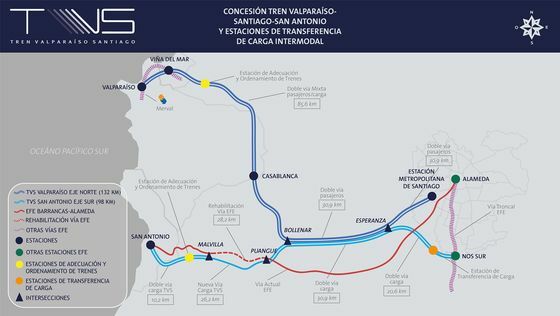 More than a year after the state-owned China Railway Group joined Chilean company Sigdo Koppers in a consortium dubbed TVS, for Train Valparaiso Santiago, officials are still reviewing whether the $2.4 billion project is of public interest, feasible, environmentally sound -- and on the level. Chileans have seen Belt and Road projects in developing countries crumble under the weight of debt and graft. “Where there is instability and corruption, there are often easier openings for infrastructure development," said Ariel Armony, director of the University of Pittsburgh’s Center for International Studies and the co-author of a book on China’s evolving role in Latin America. “Getting involved in infrastructure in Chile is a new level of maturity and developing expertise for the Chinese." The Belt and Road Initiative, which Xi launched five years ago, is meant as a modern analogue of the Silk Road, the ancient network of trade routes. China has poured trillions -- the exact figure is uncertain -- into infrastructure in Asia, the Middle East, Europe, Pacific islands and Latin America. But projects in poorer countries have been burdened by corruption and created friction by shoving aside local officials and residents, according to the Center for a New American Security. And, by definition, there is less money to be made. Now, China is pushing into wealthier nations, but stronger laws and politically active middle classes have meant novel difficulties. In Italy, an agreement last month to join Belt and Road triggered a bitter fight between the populist Five Star Movement, whose minister championed the move, and its rightist coalition partner, which warns of security threats. The European Union and the U.S. both opposed the move. 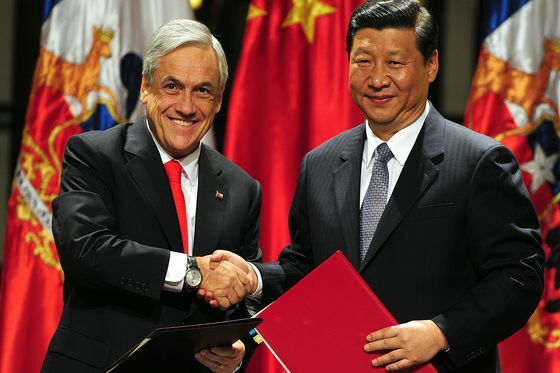 China is already Chile’s biggest trading partner, with $45 billion of goods exchanged last year, and the Asian giant covets entry into its relatively prosperous economy and stable politics. The project that TVS proposed -- and that would be open to other bidders -- would connect Santiago to Valparaiso and San Antonio on the Pacific coast. At 200 kilometers per hour (124 miles per hour), it would halve transit time to 45 minutes and transport as many as 25,000 people daily. Members of the Santiago-based executive branch could reach the congress in Valparaiso and vacationers would get fast access to beaches and the bohemian art scene. The train would also carry copper and agricultural products, with China as a top export destination. Despite Pinera’s imprimatur, the proposal must survive an exacting review that hasn’t even formally begun. The Ministry of Public Works must declare the project of “public interest” before feasibility studies and environmental-compliance checks. Then, there are civil society hearings: The ministry must consult citizens to evaluate whether the project has social benefits or risks. People can object or make recommendations at any stage. The findings are non-binding, but the meetings consume time. Even if TVS can pass those tests, gather the permits and win over the public, it would be qualified only to make a competitive bid. 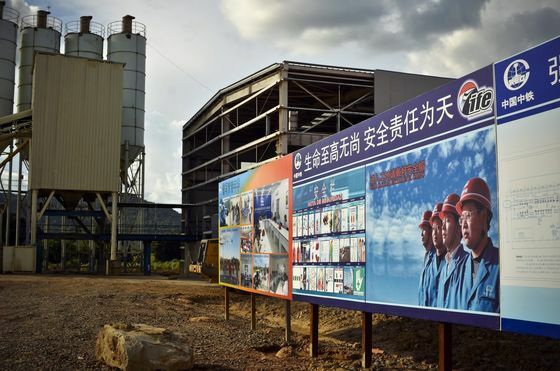 The project was first presented by the Chilean-Chinese consortium in January 2018, just months before former President Michelle Bachelet left office. Pinera made it known that under his watch, it would be done. In October, he promised that the project would be up for bid by 2019. But investors are concerned that a long vetting could threaten their investment, said Alvaro Gonzalez, director of TVS. “The biggest worries are about the permits that we need to obtain even after we win the bid and how long that could delay the construction," said Gonzalez. "Until the project is in operation, we are losing time to recover the investment." However, the intense vetting is what also makes Chile attractive. In Venezuela, a $7.5 billion railway project was left unfinished and in decay, garnering the nickname of “red elephant.” In Ecuador, former president Rafael Correa borrowed billions from China to fast track development projects that have burdened the nation with debt. A dam built in 2016 with $1.7 billion in Chinese funds has embroiled some Ecuadorian government officials in a graft scandal, while the construction withers due to structural damage. 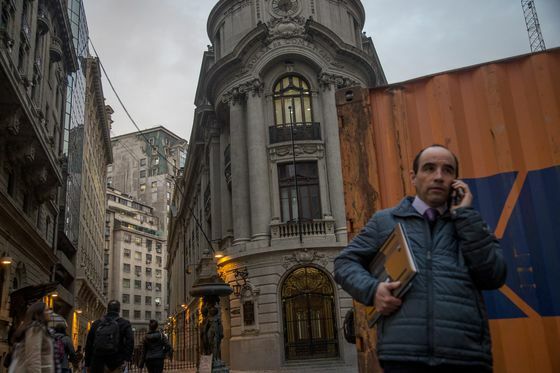 Chile, in contrast, has been crowned as the second-least corrupt Latin American country, after Uruguay, according to Transparency International. Some residents are wary of opening the door to China. Pablo Vidal, a congressman for Revolucion Democratica, a left-leaning opposition party, said that Chile urgently needs to connect remote regions along the country’s 2,600-mile length. He thinks the project is going in the wrong direction, literally. “Building a train between two urban centers of development would only continue fueling a centralized logic for the country, when the country needs to connect smaller cities in the south and north to spur economic growth," Vidal said. Vidal said a small urban elite would benefit. Chile is the region’s wealthiest country per capita, but has an income inequality gap more than 65 percent wider than the Organization for Economic Cooperation and Development average. Dario Espinoza, who owns a tour company in Valparaiso and also works at an advertising agency in Santiago, says the project could reactivate the region’s economy -- if there is a focus on job creation for Chileans. While Pinera may not be around to see the project, China seems determined to plow forward with a new strategy for railroad diplomacy in the region despite the delays.